By all possible measures the US presidential election of 2016 has set a record low in the quality of political discourse. However, with the outcome handing the Republicans a decisive victory in the White House, Senate and House of Representatives contests, the election will have a lasting and systemic impact on the development of economic and social policies in the US for years to come. First, the presidential contest failed to develop key policy proposals that could define the new administration. In a way, by diverting election debates away from large-ticket economic and social issues toward personalities, legal and ethical mudslinging, and geopolitical blame-games, both Donald Trump and Hillary Clinton have cleared the water for a rudderless new Presidential Administration. Key issues including immigration, healthcare, social insurance and taxation, spending and fiscal policies, and economic strategy were left largely unaddressed. This leaves the legislative agenda to the Republican-controlled Congress. This is a far better outcome than the commentariat allow, but not as good an outrun as those of us expecting significant economic change would have wished for. Second, for all the differences between them, both candidates were aligned in one specific area: their propensity to shower voters with promises irrespective of their costs. While Trump mentioned the Federal debt overhang, his policy priorities included accumulation of more debt to fund increased social security handouts to interest groups, massive infrastructure investment, and tax breaks. His isolationist stance on foreign trade also implies heavier debt though the effect is unclear. Hillary Clinton was even more profligate that Trump. 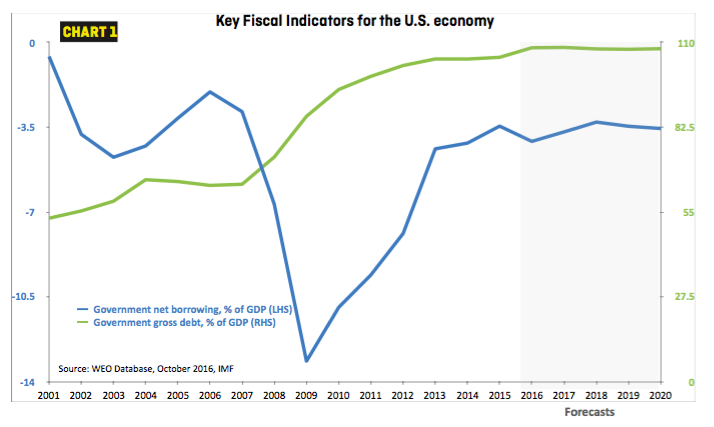 The US is heading for Government debt of over 108% of GDP in 2016, and up until 2021. With President Trump and the Republican-controlled legislature, the likely outcome will be that US Federal debt will remain high, as the deficit swings from the 3.5% average expected 2017-2021 to closer to 3.7-3.8 percent. Most of this debt will go to fund military expenditure (the so-called modernisation of the US armed forces will take trillions out of the Treasury, interest groups, and a wave of tax cuts, primarily targeting capital and financial markets, as well as the upper-middle class and higher earners. Third, neither of the candidates offered a serious plan to address competitiveness, including bureaucratic regulations and the tax codes, especially corporate taxation that incentivises capital flight and corporate-tax avoidance. Trump vaguely talked about the need for change, but never offered specific measures. Hillary Clinton advanced only marginal reforms. By default, the regulatory and tax agenda will now shift to Congressional Republicans. As a result, we are likely to see unwinding of even the feeble banking and financial-services reforms currently in train. Clawing back Federal controls and giving more room to individual States is preferable to the Democrats top-down approach. Fourth, while both candidates decried the loss of competitiveness and jobs in the manufacturing sector, neither offered a plausible solution. Declining labour-productivity growth, stagnant total-factor productivity, and the challenges of growing automation and robotisation, including for many services, remain untouched. And there was nothing constructive on offer on external imbalances and the impact of the trade deficit on the domestic economy. On balance, therefore, the Democrats loss across ensures that the gridlock and acrimony that characterised the presidential contest will now be past. Much however, remains uncertain, given the unclear divergence of agendas between the Republican legislature and the Republican Presidency. While the US economy inherited by President Trump appears to be in much better health than the one inherited by President Obama in January 2009, US growth has been weak and the risks of a new economic calamity are rising, not abating. Within the last two weeks, the US economy reported a much better trade deficit for September, down 10 percent compared to August. This is the best external trade imbalance in 19 months driven by the fourth straight monthly rise in exports. Exports rose 0.6 percent on a monthly basis, reaching the highest level since the summer of 2015. The silver lining imported a couple of clouds: much of the recent gains were driven by lower energy imports and the weaker dollar, albeit this was moderated by the undesirability of currency volatility. However, since the dollar is expected to further strengthen as US monetary policy tightens, the likelihood of these trade gains continuing is low. A Republican-controlled Federal Government will deliver current account deficits that remain around 2.5-2.7 percent of GDP over the next four years – below the 3.4 percent average for the last ten years, but not healthy enough to support export-driven growth. Another bright spot in the economy over recent months has been the labour market. Based on October figures, US pay levels are rising at the fastest pace since 2009 and unemployment currently stands at 4.9 percent, a near eight-year low. Healthcare companies, white-collar professional services, education and financial firms now lead job creation: a change of fortune from the low-wage-jobs growth that characterised 2015. In line with tight labour markets, hourly average pay jumped 0.4 percent in October, to $25.92. This implies we are now witnessing a change in the US labour market compared to 2015, when gains in income were predominantly concentrated amongst the non-working population. Judging by the headline numbers, the pace of the jobs recovery since 2008 has been faster than after the 2001 recession, and is running closer to that of the recovery of the 1990s – the last ‘golden’ era of growth. It all sounds wonderful. And yet… those in unemployment for 27 weeks or longer (the US definition of the long-term unemployed) currently account for 40 percent of all unemployed, the lowest share since 2009, but still well above the same figure at the same time after previous recessions. It is also roughly double the average rate across the growth cycle. This attests to the severity of the Great Recession, but also reflects the simple fact that the US economy continues to deleverage, meaning that the massive fiscal and monetary stimuli deployed over the years are having less impact than in normal recoveries. The acceleration in robotisation and automation of production is playing havoc with the ‘normal’ expectations about the recovery, and, as noted above, is catching the policymakers off-guard. As a result, US labour markets are witnessing growth in low-paid services jobs, such as for the hospitality sector including restaurant staff and bartenders, as well as for highly-skilled jobs. Those with skills between the extremes are falling out of the labour force in record numbers, squeezed by weak domestic demand and technological changes. These dynamics existed before the onset of the Great Recession, but eight years into the recovery, they are only getting worse. The new Presidential Administration will therefore be taking over an economy where those with post-graduate education are earning more, the bulk of those with undergraduate degrees are witnessing wage stagnation, and high-school-educated workers are seeing their real wages falling precipitously. The fact the economy is now running closer to its full growth capacity is adding insult to the already grave injury, for them. The technology-induced gap in earnings is unlikely to be reversed by traditional policies and will require drastic reforms of US education systems – something that, once again, was not a part of the election agenda, nor of the Republican party congressional platforms. Currently, the US sits around the middle of the OECD distribution for educational attainment. The problem is exacerbated by the fact that the US education system inequitably fails to provide access to high-quality education for economically disadvantaged kids. US Census data show that one quarter of children under the age of six live in poverty. The likelihood of these children graduating from a high-quality college is extremely low. One recent study, conducted by McKinsey, estimated that the failure of US education systems to integrate more underprivileged kids is costing the US economy some 3-5 percent of GDP. One indicator of these costs is the fact that despite tight labour markets, the labour-force participation rate is now sitting at 62.8 percent, well below pre-crisis levels and not consistent with past recoveries. In the meantime, rising wages (up 2.8 percent in 2015, the highest rate since mid-2009), create stronger momentum for the US Fed to raise interest rates now the election is over. The prospect of such a move is yet another problem to be inherited by the new Administration. Most recent signals from the US Fed have been pretty unequivocal in signalling rate rises from December 2016. Based on the current labour-market performance and headline growth figures, the room for monetary tightening is closer to some 400 basis points, which will bring US rates within 75 basis points of historical standards. Imagine the havoc that such a tightening could bring about. Raising interest rates will cool off household and corporate investments, by raising the cost of borrowing and reducing the funds available for investment. Further losses will be triggered by diverting investment away from financial markets and equity to cash and money markets. A rising dollar, which will follow any tightening, will cut US exports and boost US imports – a twin shock to the economy and, ultimately, to employment. Worse: as the Fed embarks on its post-elections rate hikes, US credit markets are bracing for corporate debt re-pricing. Not only the cost of raising debt will go up, but default rates are likely to rise in line with interest rates, as the recent (post-2009) credit binge has left a massive mountain of junk debt on US corporate balance sheets. Based on the latest S&P Global Market Intelligence data, the US credit downcycle is now evident 1Q 2016 has “endured the most significant activity when downgrades out-numbered upgrades by a 3.2:1 margin… Each successive quarter reduced the ratio to the third quarter’s 1.4:1”. Still, 17.6 percent of all rated firms at the end of 3Q 2016 had either a Negative Outlook or were on CreditWatch Negative. Only 7.3 percent of firms had a Positive Outlook or are on CreditWatch Positive”. So, according to S&P, when it comes to the speculative grade, we can expect “an increase in defaults over the next year”. In simple terms, the economic cycle is extremely fragile. Like Ronald Reagan, Donald Trump may be staring at a recession in his first year in office – a risk that was in place irrespective of the outcome of the election. However, unlike in Reagan’s case, this recession will face an already exhausted monetary policy space and an extremely fragile fiscal position. The triggers for a crisis rest not only within the US economy (the risks outlined above), but also in the weak global economic outlook. 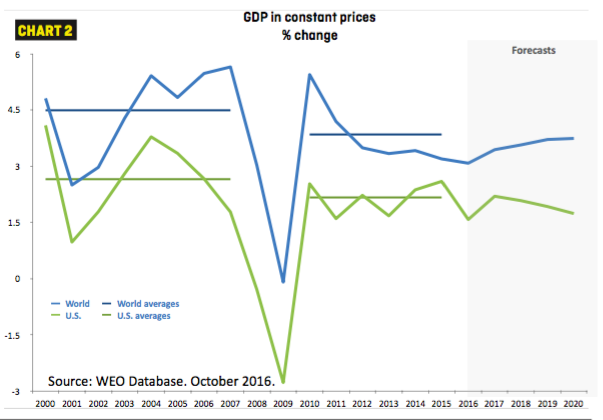 Global growth has slumped from the 2000-2007 average of 4.5 percent, to 2010-2015 average of 3.8 percent. This year, we are expected to see global growth hitting the post-crisis low at 3.08 percent. In the US, the dynamics are similar, with 2000-2007 average growth at 2.6%, falling to the post-crisis average of 2.17% and sitting below this range for FY 2016 forecasts. Of all G7 economies, only Germany is posting growth ahead of pre-crisis levels, driven by poor historical growth as much as by actual economic strength today. In the developing and emerging economies, the story is the same, with all BRICS, from Brazil to South Africa currently exerting a strong drag on global growth outlook. The range of risks to even this, relatively lacklustre performance, is huge. It includes the risk of a Chinese hard landing from a massive property and debt bubble inflated across the Chinese economy over the last decade. It also includes the never-abating risk of sovereign and corporate debt bubbles bursting in the advanced economies, where years of extremely loose monetary policies have succeeded in inflating massive debt loads for governments and companies, without improving the growth outlook. Beyond this, there are political and geopolitical risks, both with huge economic consequences in tow. Conflict in Syria, instability in the rest of the Middle East and across North Africa, the rising power of Iran in Central and Southern Asia, a tidal wave of populism sweeping across the advanced economies and the revival of nationalism and corporatism in Latin America – could trigger a new economic crisis. Whether or not Donald Trump’s presidency will be able to handle any of these crises and risks remains open. But, using his Presidential campaign as a benchmark, the odds are not too great on America being made great again soon.